ZACHARY LEVI is “Shazam” in the new superhero film. Coupled with the much-praised “Wonder Woman” and “Aquaman” movies, this one demonstrates a kind of sweet spot focus for its films: big action with winning humor. For those of you not steeped in comic book lore, the character Shazam is the spiritual descendent of Superman. After the initial success of the Man of Steel, DC rival Fawcett Comics in the early Forties came up with its own version, called Captain Marvel. It was too successful of a version, and DC prevailed in a very lengthy and costly legal battle over copyright infringement, since the Cap did seem a bit derivative of the guy from Krypton. DC acquired the character, and mostly set him on the sidelines for decades with an occasional revival. In the course of events, DC kept the character, but the character’s name – Captain Marvel – ended up with Marvel Comics. Now, finally, the character has his turn on the big screen and the film is earning big box office and generally appreciative reviews. Briefly stated, Shazam gets his super-powers when he is chosen by a wizard to be his successor. However, that’s a 14-year old foster child named Billy Batson (Asher Angel). His ally is fellow foster kid Freddy Freeman (Jack Dylan Grazer), who – being a superhero fan boy – helps Batson/Shazam – uncover his amazing new abilities. 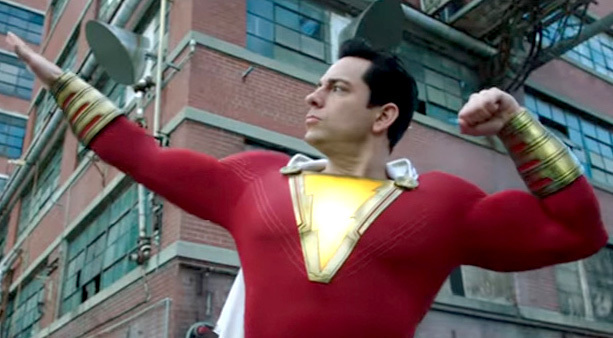 Although the boys provide much winning humor, Zachary Levi as the new Shazam is the standout of this film, adroitly managing to channel the contradictions of the high school freshman into the body of a thirty-something demigod. There are showy battles with bad guy Dr. Sivana (Mark Strong), but the best parts of the movie are the charming set pieces as Shazam uses his powers to help fight crime while indulging in adolescent hijinks. Director David Sandberg does a good job of balancing it all, working from a screenplay by Henry Gayden. After a slow start, “Shazam” picks up speed and ends with a satisfying conclusion, and features an even-better cameo appearance. It certainly looks like this magical muscle-man will be back, as is the status of DC/Warner Bros. as makers of enjoyable superhero flicks. “Shazam” is rated PG-13 for some violence, language and alcohol use.